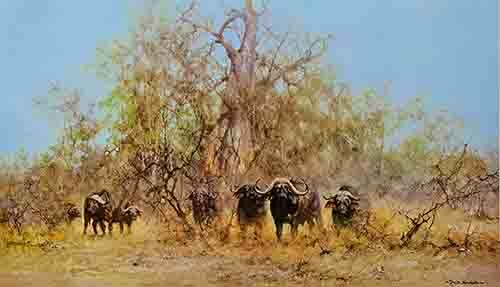 Signed, limited edition prints, "Buffalo"
Head Gamewarden in Nairobi and said, 'I'm here, can I be a game warden?' I was told I wasn't wanted. "But my dad was marvellous and said that if I really wanted to be an artist, I'd better get some training. The only school we knew anything about was The Slade School of Fine Art in London, so I sent them my first bird painting." The Slade, too, turned him down. He had no talent, they said, and he wasn't worth teaching. The bus driver position was looking more likely all the time, except for a 'chance meeting that changed my life'. At a London cocktail party, the young artist was introduced to Robin Goodwin. of the finest marine painters of this century). He didn't and wouldn't take students, Robin told him, but he agreed to have a look at the work. for reasons that I have never been able to understand, he decided to take me on. I owe all my success to that man. He is responsible for my being where I am today." In 1976, his autobiography, 'The Man Who Loves Giants', was published and rapidly became a best seller. 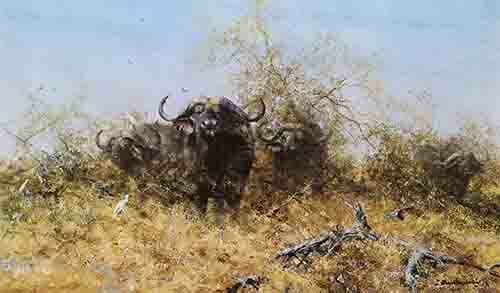 which is a stunning collection of the best of his wildlife art with over 90 colour plates. 'Painting with David Shepherd, His Unique Studio Secrets Revealed' was published. by his friend, the late James Stewart, and which has been shown all over the world. in Zambia of an ancient locomotive and railway coach and their 12,000 mile journey back to Britain. after raising funds with other artists, (through an auction of seven paintings in the USA). This enabled him to buy a helicopter, which he presented to the Government of Zambia for anti-poaching work. which raised over £100,000 for DSWF's wildlife projects.